Danielle Washington of the Wyman Center walks Ozzie Furlow through financial aid literacy training at St. Louis Graduates' High School to College Center. Furlow plans to enroll as a freshman at Arkansas Baptist in August 2016. Missouri Western is in St. Joseph, four and a half hours away from St. Louis; and without full-time admittance, the high school wrestler was going to have a hard time making his way on his own. So his counselor from Hazelwood East sent Furlow to St. Louis Graduates’ High School to College Center to see if the staff there could help. 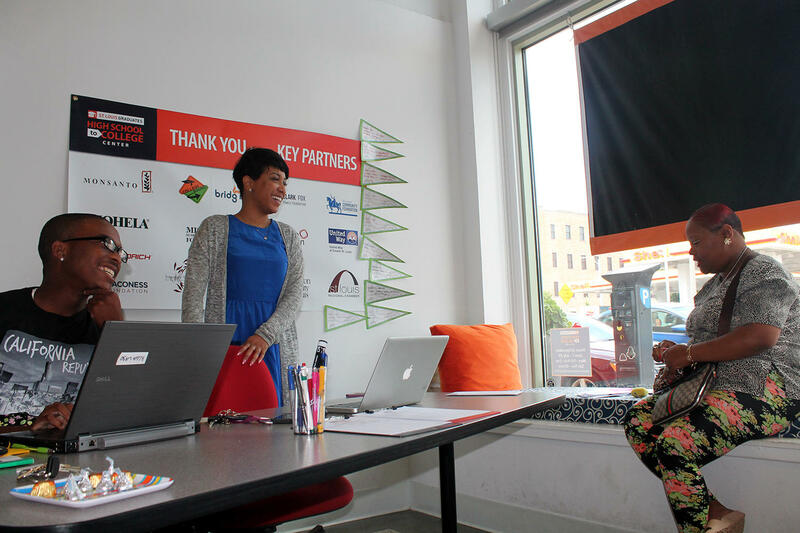 St. Louis Public Radio's Camille Phillips reports on the drop-in center for recent high school graduates that is designed to help more St. Louisans go to college. “Kendric asked me did I wrestle. Like, how good was wrestling to me,” Furlow explained. “And I said it was good, like it was life. And he said ‘I know somebody down at Arkansas Baptist that wrestles'." It had spots. Kendric Carlock is a junior at Missouri Southern University and a peer counselor this summer at the High School to College Center. 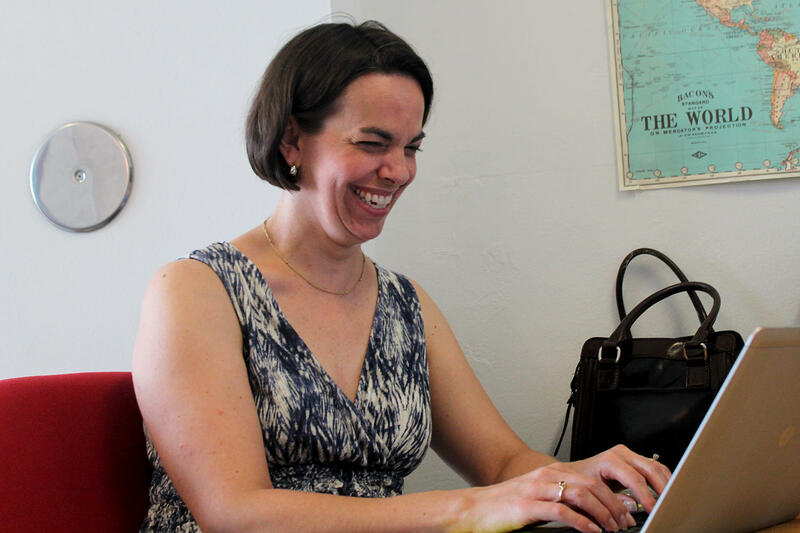 Three years ago, Carlock was one of the students looking to the center for advice. Now he’s back to help guide new graduates using the expertise of his recent experience. Peer counselor Kendric Carlock and High School to College Center Co-manager Amber Overton talk with Leleshay Furlow while she waits to help her son make financial decisions about college earlier this month. At Carlock’s recommendation, Furlow applied to Arkansas Baptist while he tried to appeal Missouri Western’s decision to limit him to part-time. A few weeks later, Furlow was accepted by Arkansas Baptist. He talked to the wrestling coach and decided to attend the historically black college. With less than a month until Furlow had to be in Little Rock, he and his mom Leleshay Furlow stopped by the drop-in center for a follow up visit on a recent Friday morning. The plan is to get Ozzie’s finances and paperwork squared away before he leaves for Arkansas Baptist on Aug. 6. The center is tucked into an unassuming storefront on Skinker Boulevard just past the bustle of Delmar Loop. Inside college banners line the walls. Carlock greets them at the door with a “Welcome to the Center,” and helps mother and son sort out paperwork. “They did send him a housing application, but we were rushing down here and we forgot it,” Leleshay Furlow said. “We can try to print it,” Carlock assured her. With everything changing so quickly, Leleshay Furlow said it still hasn’t quite sunk in that her son is going to school full-time. “When you don’t know what way, what direction to go and stuff happen good for you it’s like, 'Oh God, this is real.' I’m still processing. He’s going to college. He’s really going,” Leleshay Furlow said. Ozzie Furlow’s case is a bit unique — most students have a pretty good idea where they’re going to college before high school graduation. 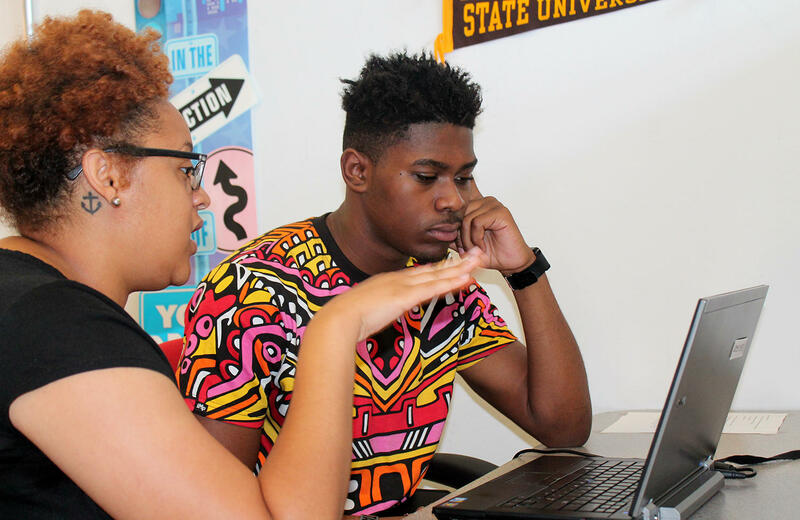 But summer deadlines make it impossible for high school counselors to completely prepare students for college before they receive their high school diplomas, said East St. Louis High School counselor and center co-manager Amber Overton. “Come June pretty much all of them have applied for schools; they’ve submitted their FAFSAs, at least for the first time. They’ve got a pretty good idea of where they want to go to school; they might have their award letters,” Overton said. “But then comes that summer. And then students get selected for verification for the FAFSA, so a lot of them don’t realize they have to turn in extra paperwork in order to actually get their financial aid. “They have to submit housing deposits, so that can be $150, $200. That could be the difference between the student actually enrolling in the fall and not being able to go to school. St. Louis Graduates opened the High School to College Center four years ago to reduce what researchers call summer melt: nationwide up to 40 percent of low-income high school grads who plan to go to college don’t enroll come fall. St. Louis Graduates’ overarching goal is to increase the number of people in the region with college degrees by making sure black St. Louisans and low-income St. Louisans have better access to college. Allison Williams is co-chair of St. Louis Graduates and a senior vice president at Wyman Center. “About 43 percent of the adults in our community have a post-secondary degree, but that rate stands at only about 28 percent for our African-American citizens. So it’s really both a moral and an economic imperative for our community to make sure there is post-secondary degree equity,” Co-chair Allison Williams said. Initial numbers for the center seem promising; according to Williams, about 75 percent of the students who stop by the center start college the following semester. “While we would certainly like to continue to improve on that side, we’re certainly besting the national averages in terms of services to St. Louis area students,” Williams said. “We’re absolutely happy with the center’s progress, and at the same time we know there’s so much more to be done. The level of disparities in degree attainment is complex. And the center is really only one part of what needs to be a multi-pronged approach,” she added. 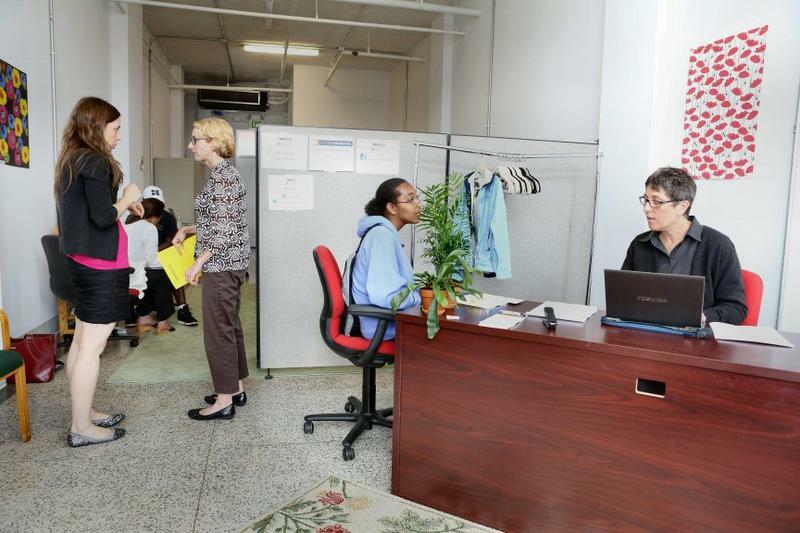 So far the center has helped about 750 students navigate the final steps to college. Williams acknowledges that the number is a drop in the bucket in terms of the number of young people in the region. One change that needs to take place, Williams said, is for the state of Missouri to rethink its scholarship systems “through a lens of equity” so that there is more focus on need-based aid. A big part of helping students navigate the final steps to college is making sure they have a plan in place to pay for it. For Ozzie Furlow that means first making sure he knows about the different types of college funding available: his Pell Grant, work study, subsidized and unsubsidized loans. Thurman Young of the Scholarship Foundation of St. Louis looks over Ozzie Furlow's financial information before he sits down to talk about paying for college with the Furlows. 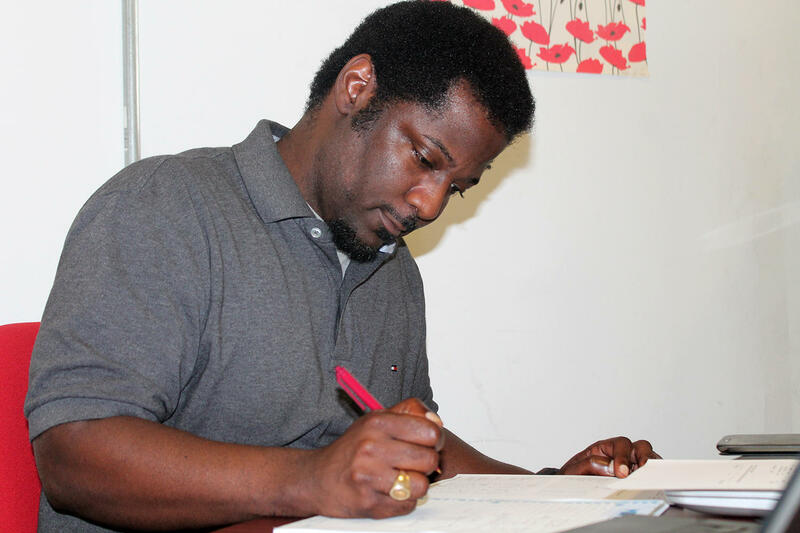 Before he leaves the center, he and his mom will go through his financial aid package step by step with Thurman Young, the director of student accounts for the Scholarship Foundation of St. Louis. Together they’ll decide how to fill in the gaps left behind after his Pell Grant and work study. Young’s organization offers interest-free loans, grants and scholarships to St. Louis students. If possible, Young tries to help students avoid federal debt entirely. “We’ll crunch the numbers and we’ll see exactly how much — the remaining balance — (Furlow will) owe after financial aid is applied, with student loans and without student loans, and we’ll also analyze what his aggregate amount of student debt he’ll have after graduation. And if he has the time we’ll figure out how much his monthly payments will be after graduation,” Young said. That way when Ozzie goes down to Little Rock for his freshman year he can focus on being a student. “It’s not going to be easy because I know college work is going to be extreme, and wrestling is going to be extreme. So I just got to stay focused and keep on the right path,” Furlow said. Staying on the right path to get a college degree is ultimately what St. Louis Graduates hopes happen for all the students the organization helps. 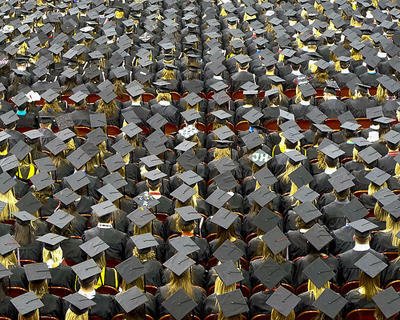 The coalition of organizations behind St. Louis Graduates is striving to see 60 percent of St. Louisans with a college degree or certificate by 2025. Yvaunna Brown just graduated from Hazelwood West High School and feels like the future is wide open. She’s thinking about community college, or maybe the University of Missouri-St. Louis is a better fit. Brown is dead set on one thing, though: becoming the first person in her family to go to college. It’s also daunting. Loads of paper work must be completed and the deadlines will start coming fast.